That time of year again! Just take a second with me to reflect on how big this community, specifically the RPGaDay trend in August, has grown! While I believe that tabletop RPGs provide a never dry well of inspiration and questions to be answered, it still amazes me to see the variety presented in these. I’m a bit late to the game (nothing unusual there), so in an attempt to not bog myself and my blog down, I’m just going to post these in blocks (maybe 7 days worth at a time, give or take). Physical dice, hands down. I love collecting them, I like drilling holes in them and turning them into jewelry, I love giving them to my kids so they can marvel at the color combinations. I love dice. I like dice apps for when I’m rolling up characters or NPCs for fun, it’s quick, easy, and my phone does the math for me. I’ve never played diceless before, but I have a couple of diceless storytelling RPGs that I’ve yet to play; it’s hard for me to imagine, but I’d give it a try. Check out the newest “molton purple” set I got! Pink and purple marbled with gold lettering. Beautiful. 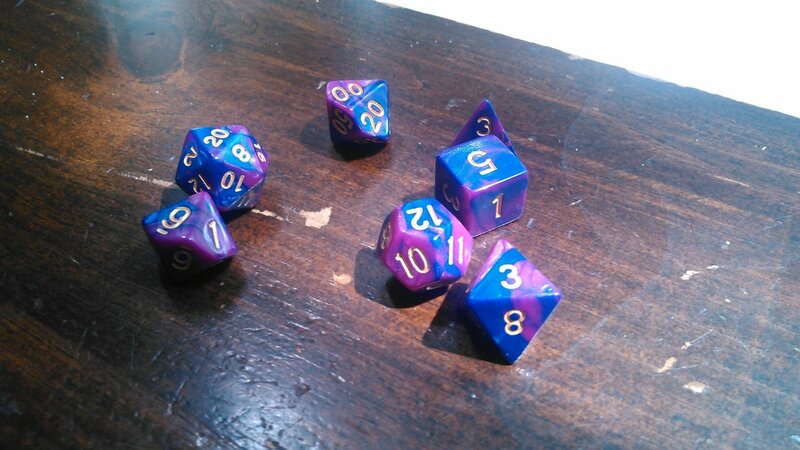 And they roll pretty randomly, too! Unfortunately, I’ve only had the free time to play a couple of sessions in the past year (children are a joy, but they sure are needy). I’d have to say my favorite session was one a few months ago, playing Rifts with my Dad, Brother, and a friend. I was playing a Battle Magus Controller (essentially a magic using, golem master), and we were attacked by two huge monsters. Using my Automaton, my character not only sliced the monster in half (turns out it was a giant robot), but then disintegrated its head with a magical blast. It was a crazy night of amazing rolls, let me tell you! You can read how that party all got started here.